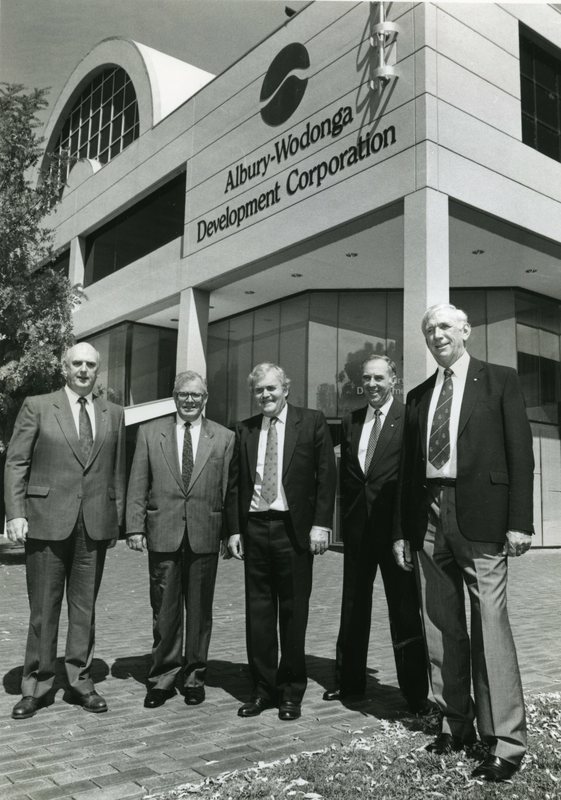 The Thurgoona site of the Albury-Wodonga Campus was purchased from the Albury-Wodonga Development Corporation (AWDC). (L-R): Pro Vice-Chancellor Bryan Rothwell, Vice-Chancellor Cliff Blake, Board of Governors’ representative Gordon Beavan, AWDC Chairman Max Hanrahan and Chancellor David Asimus. “Thurgoona Campus Land Purchase,” CSU Regional Archives Digital Gallery, accessed April 26, 2019, https://csuregarch.intersect.org.au/items/show/2198.